From June 3 through November 5, 2017, Bruce Munro: LIGHT at Nicholas Conservatory & Gardens will allow visitors to see the gardens in a new light. The exhibition is Munro’s eighth large-scale garden exhibition in the U.S. The gardens and Conservatory will provide a stunning backdrop for eight sculptures, including Munro’s iconic Field of Light and Water-Towers. Two new works will also debut — Sun, a monumental globe, suspended inside the Conservatory, and Don’s Flamingos, a playful homage to the designer of the pink lawn flamingo, Don Featherstone. 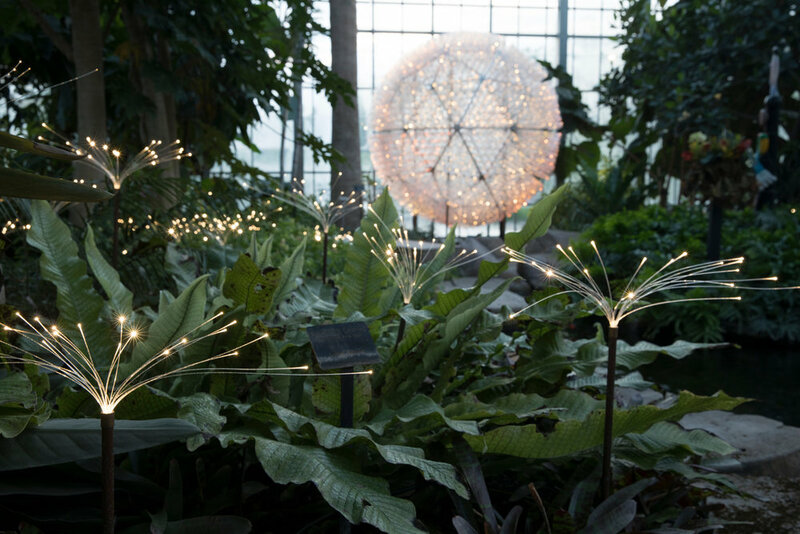 Past exhibitions of Bruce Munro’s work have received both critical and popular acclaim. Visitors are expected to travel from Chicago, Madison, Milwaukee, Bloomington-Normal, the Quad Cities, and beyond, truly putting our young garden on the “who’s who” of public gardens. Visitors are encouraged to take photographs of Bruce Munro’s artwork, however any commercial use, reproduction or sale, directly or online, of any images is strictly prohibited and may expose violators to civil and criminal penalties. No license is granted, expressed or implied to make commercial use of any of Bruce Munro’s work. Anyone wishing to seek permission for any commercial project should contact Bruce Munro Studio at info@brucemunro.co.uk. British artist Bruce Munro is best known for producing large immersive light-based installations, which often employ a massing of components by the thousands. An artistic diarist, he has spent over 30 years collecting and recording ideas and images in his sketchbooks, which he returns to over time as source material. Language, literature, science, and music have also greatly influenced his work. Frequently, Bruce’s subject matter is his own experience of fleeting moments of rapport with the world and existence in its largest sense of being part of life’s essential pattern. His reoccurring motif is the use of light on an environmental scale in order to create an emotional response for the viewer. Munro’s work has been widely exhibited, including by the Guggenheim Museum, NY; Waddesdon Manor for the Rothschild Collection, UK, Longwood Gardens, PA, and Texas Tech University. His landscape installation “Field of Light” is at Uluru, Australia through March 2018. His work is held in the collections of museums and botanical gardens internationally, including the Ashmolean Museum, Oxford, UK.